While covering a high school swim meet, I sat down during the girls’ 500-yard freestyle — ’cause that’s a pretty long race, and my feet were tired, and I haven’t felt well in a week — and checked my phone. Then I saw that my editor had texted, called and left a voicemail. Then I left to cover a plane crash that happened about a mile and a half north of the school. © 2011 by The York Daily Record/Sunday News. 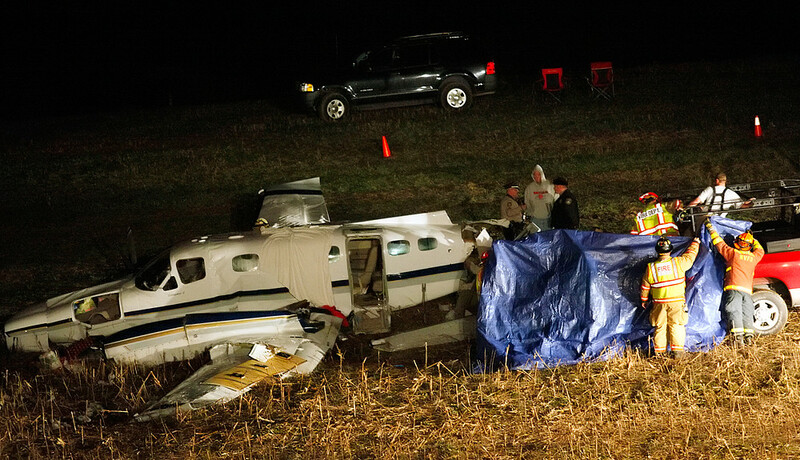 Emergency crews remove the body of a 38-year-old man who crashed this two-engine, 1980 Cessna plane in a farm field in Jackson Township on Thursday, Dec. 22, 2011. The man, of California, was pronounced dead at scene. Read Rebecca and Teresa’s article for more details.